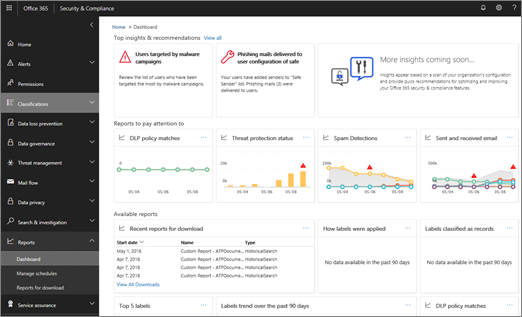 If you are part of your organization's Office 365 security team and have the necessary permissions assigned in the Office 365 Security & Compliance Center, you can access a variety of reports, including smart reports and insights. Read this article to get an overview of these reports and insights, and where to go to learn more about specific reports. In addition to highlighting problem areas, smart reports and insights include recommendations and links to view and explore data and also take quick actions. For example, if your organization suddenly has a high number of email messages being marked as spam by end users, you might be advised to revisit your anti-spam policies to ensure the right level of protection is in place.